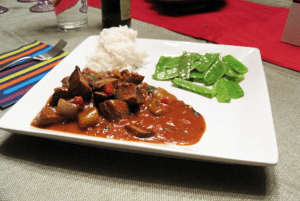 This sous vide beef Goulash is adapted from the recipe in the wonderful book German, Austrian, Czech and Hungarian: 70 Traditional Dishes from the Heart of European Cuisine. It's a great wintertime dish and is really hardy, especially when served with a good sticky rice or mashed potatoes. The beef is first cooked sous vide and only added to the goulash itself near the end, ensuring the meat is not overcooked. We replaced the lamb in the original recipe with sous vide stew beef and added mushrooms for some extra depth. We only cook the beef for 24 hours so the resulting meat isn't meltingly tender. 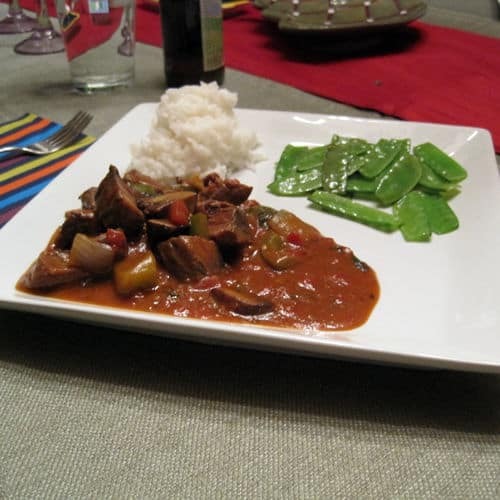 We've found that beef chunks that are the typical sous vide tenderness do not have the chewy bite that is typical in stews and chili and leaves the end dish lacking. The reduced cooking time leaves some of the chewiness while still tenderizing a majority of the meat. If you would like more information about the modernist techniques, ingredients, and equipment used in the Sous Vide Beef Goulash you can check out the following. Pre-heat the water bath to 131°F. Season the meat with salt and pepper and the garlic powder then seal in the sous vide pouch and place in the water bath for about 24 hours. You will start to make the goulash itself about 30 to 45 minutes before you want to eat. Heat up some oil in a deeper frying pan or pot. Add the onion and garlic and saute for several minutes, until they begin to get translucent then add the green peppers and paprika and saute for another 2 minutes. Remove the onions and pepper mixture from the pan and add some more oil and the mushrooms. After a few minutes the mushrooms should begin to brown and release their liquid. Add the onion and pepper mixture back to the pan with the mushrooms and add the tomatoes and beef stock. Stir to mix and let simmer for 10-15 minutes so the flavors can meld and the sauce can thicken some. Mix the cold water with the flour and add gradually to the goulash, mixing thoroughly, until it becomes the thickness you desire. Remove the sous vide beef from the water bath and add to the goulash. Add the parsley to the goulash, mix well, and then serve.